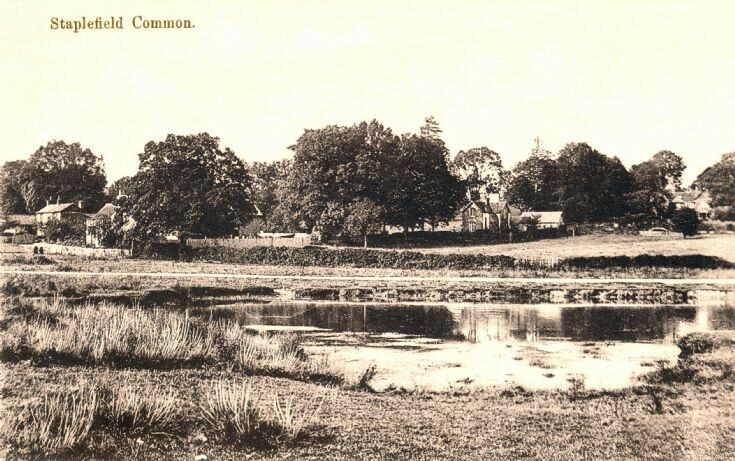 Understandably, the pond on Staplefield Common was the subject of many photographs before it was filled in just after the second world war. From the left can be seen the post office stores, Pear Tree Cottage, The Tanyard and Staplefield Grange. A fellow pupil at St Mark's was Mark Hayward, the adopted son of Mr and Mrs Hayward of Holmstead Farm, Staplefield. The family were famed for their Hayward’s Military Pickle factory in London, a pickle which, by the way, is available in our local supermarket in Hong Kong! Mark was the envy of the class because he had recently been given a WATCH! As the pond was being filled in we all rushed out to, er, "help" Mark put his hand and arm in the water to catch some fish and I can still remember the look on his face as he realised his brand new watch was on that very same arm. Ir must have been the same week (probably 1953) that my mother arranged to collect several buckets of carp from the pond to stock the pond just behind our house. The carp flourished; Mark Hayward's watch didn't.